There can be no denial that technology can play a crucial role in any small business to succeed. For small business owners, the benefits of technology are immense. Not only it provide opportunities to cut down manpower and other physical resources, it significantly helps in managing data flow, enhance communication, track business progress, market products or services and improve customer retention. There a number of tech tools available that helps to keep your efficiency up and allow you to get a complete grip on our business from a single computing device. After all, business operations need to be done quickly to stay ahead of the competition and integrating technology with operations can help you just do that. 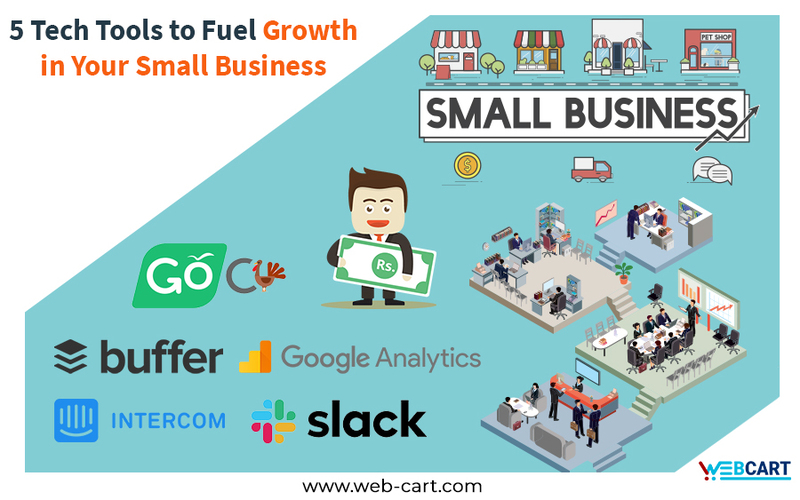 Below we will look at the 5 tech tools important for at any small business growth. Slack is an ideal collaboration tool for small business that enhances project collaboration and team interaction. It’s ideal for business with a small number of employees that work on common projects despite their different locations. The tools help in bringing all stakeholders together on a single platform where they can share information instantly, communicate efficiently, and get the tasks done much faster. With Slack, people working on the same project can share files, phone calls and message one another easily through a drag and drop. Meanwhile, it also connects with other business tools such as Paypal, Google Drives, Dropbox and more. Slack has all it takes to be a comprehensive collaboration tool any small can use to enhance the communication process within a network. GoCo is all in one HR and benefits platform. With GoCo managing HR and benefits doesn’t have to be hard like the old days. The platform makes HR administration all easy for its users. The software brings everything on a single platform you need to take care of your employees and be virtually available from anywhere to assist them. It has a design that saves your time and effort on HR related issues, so being a small business owner you can continue to work simultaneously on all different operations. The software offers a simple and intuitive administration, keeps payroll perfectly In-sync and offers worry-free compliance. All-in-all its must-have tool for any small business that wants to control all HR related matters from a single source. Social media presence has become all-important for businesses around the world. And when it comes to small businesses, strong social media presence can play a significant role at success. The buffer is a social media management platform that let any business save time and manages their social media accounts from a single place. From individuals, brands, agencies to businesses. It helps in keeping meaningful engagement with potential customers on all different social media accounts. Being a small business owner you can share to multiple Facebook, Instagram, and Twitter accounts from one place. Meanwhile, it allows maintaining a strong presence on all your social media accounts, as well as engages and influence potential customers. In addition, it also schedules your post automatically at any time you want. It’s truly an app makes it makes it easy for small business to analyze their social media performance. And easily manage all their accounts from just one place. Small business today needs to own a website to strengthen their online presence. And for small retail businesses, it’s something indispensable. Google Analytics provides businesses with the right tools to get to know their customers. It helps in analyzing data through basic website metrics. The platform provides website owners who their audience are, where your customers are, and what type of content is getting the most attention from the viewers. With high analytics attention, reporting, data analysis and visualization, smooth integration and more. It’s a must-have tool to track and/or improve your web presence. Meanwhile, tech writing specialist at 6 Pound Essay believes Google Analytics is the perfect tool to maintain a strong online web presence. Intercom is by far the best messaging platform to enhance customer engagement and retention. The tool is excellent for small businesses that struggle to connect with their customers in a better way. Intercom has multiple features that allow engaging and communicating with your customers in a smooth way. As a result, it helps to grow your business faster through better relationships. Previous Previous post: Must Know Facts About Mobile Optimization Need for your Website! Next Next post: Responsive Design, What Is It And Why Should I Care?